People who are concerned about the environment work to see to it the place they call home will be as Eco friendly as possible. At the same, these homeowners appreciate the importance of privacy in a domestic setting. The world outside should be green and welcoming, but that doesn’t mean that the outside world needs to always look inside. There are times when a little privacy means an awful lot to the rejuvenation and well-being of a tired soul. That longed for retreat can also be quite green. Windows are a primary concern because they are the public’s main spy glass into family living quarters. Privacy needs will center on blocking that outer visual intrusion and green enthusiasts can do it in an environmentally sound way. The court of first resort would be window film. This blocks out both intruding eyes and the UV radiation from the sun, and has a further benefit of making a home more energy efficient. The application can be done by professionals or a DIY kind of guy can buy commercial window film kits online and in home improvement stores. Smart glass is another alternative but it is currently quite expensive and out of the price range of most middle-class homeowners. Window film is effective but may not be aesthetically pleasing. The homeowner may wish to have something that fits in better with the decor of the room and using window film may look too industrial. Shutters and blinds are traditional forms of privacy enhancers, and the standard products are made of metal or wood. 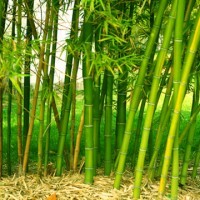 The perfect green alternative is bamboo. Wooden shutters and blinds are attractive but can result in scarce hardwood being used. What’s great about bamboo is that it is as tough as any hardwood and is also renewable, growing to a size and density appropriate to commercial use in just a few years. Bamboo has excellent decorative qualities and has been used in Asian homes for centuries. This is not the only option, and green materials can be found in other types of blinds and shades. An environmentally conscious homeowner has a fairly good selection, and can easily find the right kind of shutters or blinds to provide privacy, energy savings, and ecologically efficient benefits. A desire to close off the outside world generates an atmosphere of intimacy and relaxation where a person can be himself or herself. Thanks to the development of green construction materials, the privacy that is desired can also be environmentally sound. Moreover, green privacy enhancers can conserve energy and thereby diminish carbon emissions. Those who enjoy DIY projects may find developing a green privacy screen a delightful challenge. These amateur interior decorators can go through all of the various options and find one that is exactly suited for the inner space and hold the promise of green benefits at the same time.